Scotland had done the hard part. They had survived three and four minutes of pressure close to their own line. They had made tackles of every type; scrags and thunderclaps. They had conceded penalty after penalty and were subjected to scrum after scrum. Amid the onslaught, from the 68th minute, they had a man, David Denton, sin-binned for the kind of act that only desperate rugby players do. France got another penalty and once again attempted to inflict death by scrummaging. Scotland put Matt Scott, a centre, in on the flank - and they survived the barrage all over again. There was something heroic about it all. Sure, this was just a warm-up match ahead of the proper stuff in the coming weeks, but in those mad moments Scotland defended their line with aggression and accuracy. It was just a friendly, but the visiting pack had the intensity of men at war. When France came blasting once more, Scotland met them head-on, shoved them away to the wing and then rifled them into touch. The siege had, at last, been lifted. They had a line-out to complete the Houdini-esque escapology act. Throw it to the front, secure it, hoof it clear. Get out of there with the 16-12 lead intact with eight minutes left. They couldn't do it. The line-out throw went long - too long. France gobbled it up and from the next scrum, they scored. That miscommunication in the line-out was the losing and winning of the Test match. 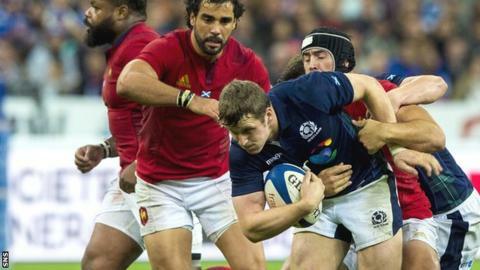 With that one blunder, Scotland's hopes of a first victory over France in nine years and a first win in Paris in 16 years went south. It's too convenient to dismiss that self-inflicted wound as just something that happens in a warm-up match. Scotland's decision to go for the tap penalty (and the win) at the death instead of taking the three points that would have given them a draw is something that happens in a warm-up match, an unreal moment that would never happen in a Test that truly mattered. But that botched line-out had a deeper significance, particularly when the French had eaten into it all night long. It spoke of an anxiety under pressure, a lack of accuracy when the heat was on, a vulnerability (admittedly against a world-class defensive lineout) that Scotland's group opponents will look at and try to work on. It flagged up the fact that though Scotland look to be making progress there are still huge question marks about their composure. With Vern Cotter's team there remains something of a death-wish. It's got to be a head-wrecker for the coach because he will have liked a lot of what he has seen this past week - the opportunism in putting up a record score against Italy at Murrayfield and in creating a try out of nothing for Tommy Seymour in Paris - and the physicality of living with an enormous - and largely first-choice - French pack. In the Six Nations, Scotland were over-powered by France in the second half at the Stade, but that didn't happen this time. The visiting scrum handled itself well. Only rarely did the French look like they were going to physically bully the Scots. Those moments passed fleetingly. That was a plus. A big plus. If you believe the stats - and if they are wrong, they won't be far wrong - Ross Ford, amid a mighty effort, made 21 tackles and missed none of them. John Hardie made 16, Jonny Gray 15 and Gordon Reid 13. Those four were the game's top tacklers, an illustration of the defensive shift that Scotland had to put in. The fact that the visitors were still alive and pushing for the win at the death was testament to their staying power and character. They had to make 151 tackles to France's 96. They lost five of their own line-outs and gave up 18 turnovers. They conceded 10 penalties in the second half alone - Wayne Barnes punished them to the tune of 16 overall compared to France's more lenient 10 - and yet they could still have won it. That's your classic 'mixed bag, curate's egg' performance. Whatever cliché you want to come up with none will be as tiresome as the greatest of all Scottish rugby clichés - the defeat snatched from the jaws of victory. It all goes back to that line-out and a lack of accuracy when it was most needed. On 23 September, Scotland open their World Cup campaign against the USA in Gloucester. If he didn't know it already, then Cotter will have clarity on what his best team is now - or most of it at any rate. Sean Maitland made a wondrous return to international rugby after seven months off injured. He looked bright and dangerous and made a try-saving tackle on Yoann Huget. He'll go to the wing when Stuart Hogg returns as full-back. The predatory Seymour will surely be Scotland's other wing, though his defence in Paris was suspect. In the midfield, Matt Scott and Mark Bennett are a burgeoning combination; defensively strong and clever in attack when they're given the opportunity. Finn Russell is, of course, a shoo-in, as is Greig Laidlaw, who has rendered mute those of us who thought his place might be under threat from Henry Pyrgos. Laidlaw was impressive against France. 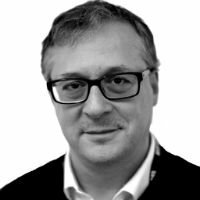 The front-row from Paris will stay in place for the big games at the World Cup - Alasdair Dickinson, Ford and the increasingly effective WP Nel. The Gray brothers are the best combination in the second-row, although Grant Gilchrist has it within him to shake them up. Behind them? The one area of uncertainty. Cotter needs Ryan Wilson to take his end-of-season Glasgow form into the World Cup, but the flanker is still looking for it. He missed a tackle on Huget that he needed to make and that kind of thing will have driven Cotter scatty. Had it not been for Maitland, Huget would have scored. The worry for Cotter is that Josh Strauss, another option at six, hasn't hit his straps yet either. He wasn't his barnstorming self when playing for Glasgow against Canada last week and didn't deliver a big one against the Scarlets on Saturday either. Cotter needs all five of his back-rows up to fever pitch - and quickly. At least David Denton was his reliable self in Paris. You know what you're getting with Denton. Many Scottish eyes would have been fixed on the guy alongside him - Hardie. The Kiwi is clever, you can see that. He reads the game well. He rarely misses a tackle. He can get wide and he can link. What Hardie does is very good, but you'd like to see him do more of it. He's a footballer, though. No question. Scotland have played four, have won two and were credible in defeat in Dublin and Paris. The preamble has gone pretty well. Now for the main event.